To anyone in need of a health and fitness makeover, what are you waiting for? Okay, I waited. Why? Because I didn’t realize how bad off I was. My physical condition and situation is a little different than most everyone else’s because I have Multiple Sclerosis. Sure, I was overweight, like a lot of other people. Sure, I am an aging male, like a lot of other people. Sure, I was out of shape, like a lot of other people. Sure, my health was no doubt declining, like a lot of other people. And, if didn’t get my fat-laden buns in to see Brian at the life-saving facility known as TheissCare I would probably be looking at an early mortality, like a lot of other people. 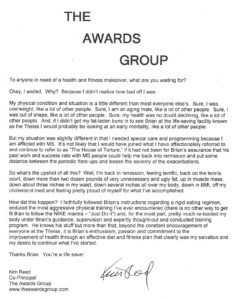 But my situation was slightly different in that I needed special care and programming because I am afflicted with Multiple Sclerosis. It’s not likely that I would have joined what I have affectionately referred to and continue to refer to as “The House of Torture,” if it had not been for Brian’s assurance that his past work and success rate with Multiple Sclerosis people could help me back into remission and put some distance between the periodic flare-ups and lessen the severity of the exacerbations. So what’s the upshot of all this? Well, my multiple sclerosis is back in remission, I’m feeling terrific, back on the tennis court, down more than two dozen pounds of very unnecessary and ugly fat, up in muscle mass, down about three inches in my waist, down several inches all over my body, down in BMI, off my cholesterol med and feeling pretty proud of myself for what I’ve accomplished. How did this happen? I faithfully followed Brian’s instructions regarding a rigid eating regimen, endured the most aggressive physical training I’ve ever encountered (there is no other way to get fit than to follow the NIKE mantra — “Just Do It”) and, for the most part, pretty much re-booted my body under Brian’s guidance, supervision and expertly thought-out and conducted training program. 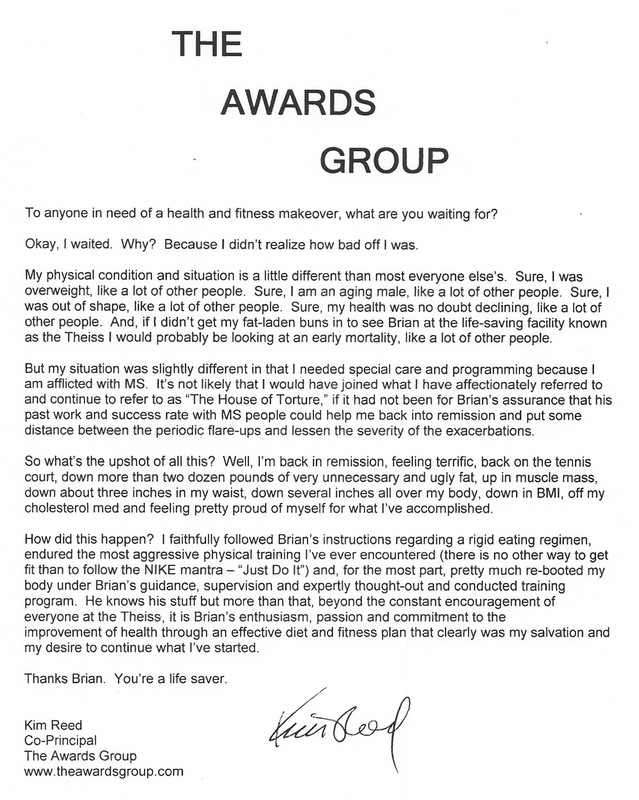 He knows his stuff but more than that, beyond the constant encouragement of everyone at TheissCare, it is Brian’s enthusiasm, passion and commitment to the improvement of health through an effective diet and fitness plan that clearly was my salvation and my desire to continue what I’ve started. Thanks Brian. You’re a life saver.